Maroon 5 are marking their Super Bowl half-time show with a $500,000 charity donation to Big Brothers Big Sisters of America. The ‘Moves Like Jagger’ hitmakers have joined forces with the NFL and Interscope records to make the hefty contribution to Big Brothers Big Sisters of America ahead of their performance at the flagship football game on Sunday (03.02.19). 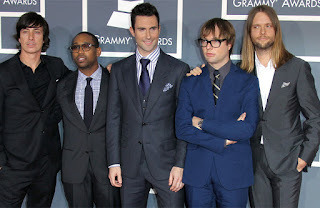 Frontman Adam Levine told People magazine in a statement: “Playing the Super Bowl has been a dream of our band for a long time. The donation is part of the NFL’s #InspireChange social justice campaign, a commitment to help create positive changes for young people in communities across the US. And Maroon 5’s contribution comes two weeks after fellow half time performer Travis Scott revealed he had signed up for the show on the condition the NFL would join him in donating to Dream Corps, a non-profit organisation that champions social justice. He previously said: “I back anyone who takes a stand for what they believe in. “I know being an artist that it’s in my power to inspire. So before confirming the Super Bowl half-time performance, I made sure to partner with the NFL on this important donation. Rapper Big Boi will also join Maroon 5 and Travis for the half-time show, which has been shrouded in controversy due to the #TakeAKnee movement to protest racial inequality.